Dear World, a catalyst for starting conversations and uniting people from various backgrounds, was hosted by Miami's Performing Arts Series on December 7. The event prompts participants to ask themselves, "What story will you tell the world?" 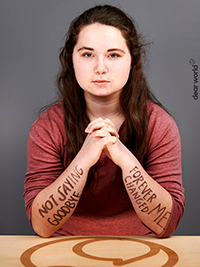 They then write their messages on their bodies for a portrait-style photo. This is the second year of the global project, which is part of Miami's Presidential Series on Inclusivity called "Ask More. Engage Intentionally. Think Differently." It has helped bring people together from all across the nation and around the world. "Dear World's effect on Miami's population is no different," said Ellie Witter, assistant director for audience development for Miami's Performing Arts Series. "Through it I have seen people connecting with each other, and I think Dear World gives everyone a voice to share their message with one another." A diverse group of Miami faculty, staff, and students attended the event in Armstrong Student Center to share their messages. Three CAS students shared their motivations and stories for this article. "He taught me how to fight hard." Morgan Nguyen: He taught me how to fight hard. When he was 16 years old, Morgan's father immigrated to the United States from Vietnam as a war refugee. "The adversity he faced contextualizes some of my own challenges and inspires me to fight hard," said Morgan, who is a senior biology major, premedical studies co-major, and English literature and history minor. Though Morgan and her father have faced different challenges, the idea of staying focused on your goals and staying strong mentally still applies. 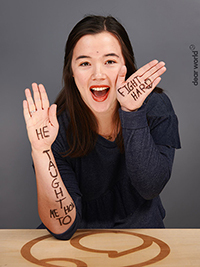 She explained that her message was originally only going to be "Fight hard," but after talking to some other people about it, she added "He taught me to" to include the story about her father. Through her message, she hopes to express the importance of parent and child relationships, and how much they can learn from one another. "But I also hope to express the importance of vocalizing your thoughts and opinions and to not let societal pressures silence your voice," she said. Morgan was drawn to the event after seeing people's photos from last year's event. "I like how they served as conversation starters, because a lot of people's phrases are rather ambiguous and you want to learn more, so it's a starting point for a conversation that you wouldn't normally have," she said. 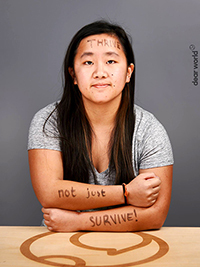 Emily Hughes: Thrive, not just survive! For a while, Emily Hughes had felt like she was living a mundane life. She has always gone to class, tried to get good grades, stayed active. She did what is expected of her and went through the motions of the college routine. She focused more on the future and what the next step is rather than truly considering the present. But then she's realized that that's no way to live. "Rather than just focusing purely on what the next step is — so in this case, looking for a job or an internship — I'm choosing to find things that I enjoy rather than prioritizing the future and the next step," Emily said. As a junior linguistics major, Emily's time at Miami has taught her to seek out things that she is passionate about — things that make her happy now even if she doesn't know where they will take her in her future. She chose to major in linguistics because it's something that she loves, even though she isn't sure where it will take her after graduating. "Now that I'm coming toward the end of my college career, rather than doing things that will be successful in a lot of terms, I'm doing things that will be successful for me personally and experience something that will benefit me rather than my wallet," she said. Emily had a class during the Dear World event last year, but made sure to make time to participate this year. "It's a really interesting way of sharing your story rather than actually telling it," she said. "Not saying goodbye forever changed me." Abigail Gabler: Not saying goodbye forever changed me. Four years ago, Abigail Gabler lost her grandmother. She passed away while Abigail was at a dance recital and she never got to say goodbye. When Abigail was growing up, her grandmother lived right down the street. She would visit her every day and do her hair or paint her nails. Her grandmother always wanted Abigail to do whatever made her happy. Although she's now a freshman biology and pre-med major, becoming a doctor was never something she really considered as a child. But since her grandmother passed away, it has become her goal. Abigail wants to help people, and she doesn't want anyone to be alone. The absence of her grandmother still very much affects her, but she's been able to move on. "Just because something happened, don't let it drag you down," Abigail said. "For me, I was really sad for a long time because I never got to say goodbye, but talking about it and talking to others about it allows you to be free again." Author Maya Fenter: WHERE did she come FROM? WHERE will she GO? Last year, Dear World brought over 300 participants, and Witter estimates that they had over 300 participants this year as well. She is pleased with student involvement and its impact on the Miami community. 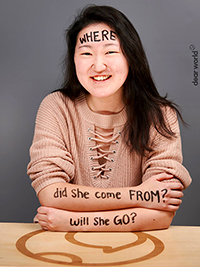 Sophomore Maya Fenter, the author of this article and a journalism and interactive media studies major, posed with her own message, "WHERE did she come FROM? WHERE will she GO?" "I think Dear World has helped to bring people together in ways we couldn't have imagined," Witter said. View more photos at Dear World Live at Miami University.